Derek Sinclair Cox (born September 22, 1986) is an American football cornerback in the National Football League (NFL) who is currently a free agent. He was drafted by the Jacksonville Jaguars in the third round of the 2009 NFL Draft. He played college football at William & Mary. Cox attended Junius H. Rose High School in Greenville, North Carolina. He played with Houston Texans running back Andre Brown. Cox was a four-year starter for William & Mary. He was a two-time All-Colonial Athletic Association selection and finished his senior season tied for fifth in the CAA with four interceptions and returned a pair of those for touchdowns. Despite not being invited to the NFL Scouting Combine, Cox was selected by the Jaguars in the third round of the 2009 NFL Draft. 2009 with the Jacksonville Jaguars. In his first NFL game, Cox intercepted a Peyton Manning pass intended for Reggie Wayne and also recovered a fumble. Cox finished his rookie season with 58 tackles and 4 interceptions. 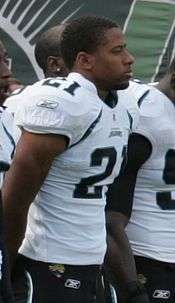 Cox missed the first two games of the 2012 season due to an injury and returned in Week 3 to face the Indianapolis Colts. Cox finished the 2012 campaign with a career best 60 tackles; he also had 1 FF and 4 interceptions. On March 13, 2013 Cox agreed to a four-year deal with the San Diego Chargers In week 6, Cox intercepted Andrew Luck to help win the game. Cox was benched three times during the regular season due to inconsistent play. He lost his starting job to veteran Richard Marshall in week 13. Cox finished the season on special teams and managed career-lows, 38 tackles and only 1 interception. He was released on March 4, 2014. On March 13, 2014, Cox signed a one-year contract with the Minnesota Vikings. He was cut after the third preseason game, on August 25, 2014. On August 27, 2014, Cox signed a one-year contract with the Baltimore Ravens. He was released three days later. Cox did not play in the 2014 season. On June 8, 2015, Cox was signed by the New England Patriots, the team released him on August 1, 2015. ↑ "National Football League: NFL Draft 2009 - Derek Cox". Nfl.com. Retrieved 2013-10-08. ↑ Barnes, Sierra (2013-09-30). "William & Mary - News & Events". Wm.edu. Retrieved 2013-10-08. ↑ "NFL Draft - CBSSports.com - NFLDraftScout.com". CBSSports.com. 2008-06-11. Retrieved 2013-10-08. ↑ Kuharsky, Paul. "Rookie surprise: Jaguars CB Derek Cox - AFC South Blog - ESPN". Espn.go.com. Retrieved 2013-10-08. ↑ "Derek Cox, CB for the San Diego Chargers at". Nfl.com. 1986-09-22. Retrieved 2013-10-08. ↑ Gehlken, Michael. "Chargers release Derek Cox". utsandiego.com. Retrieved 4 March 2014. ↑ "Ravens cut veteran CB Derek Cox". CBSSports.com. 2014-08-06. Retrieved 2014-09-15. ↑ Archived February 4, 2010, at the Wayback Machine. ↑ "Ourlads' 2010 All Rookie Team". Ourlads.com. Retrieved 2013-10-08.